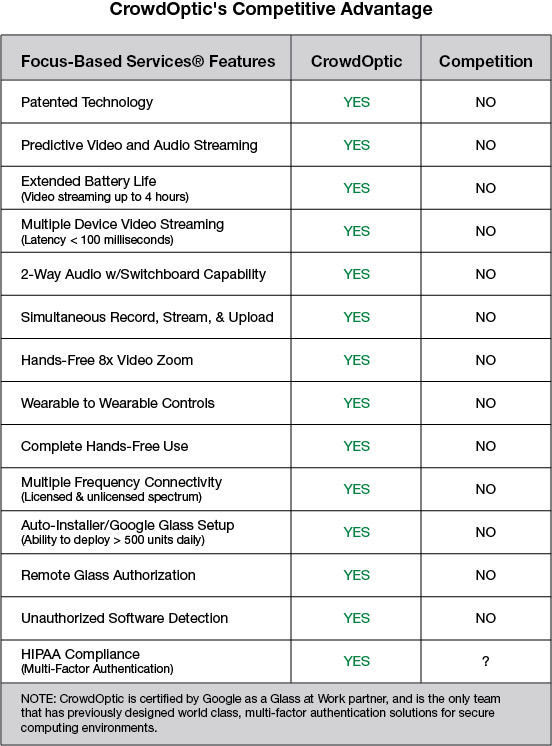 SAN FRANCISCO, CA--(Marketwired - November 24, 2014) - CrowdOptic, the most advanced software for live broadcasting from smart wearable devices like Google Glass, today announced new features designed for live audio/video streaming applications in the enterprise. 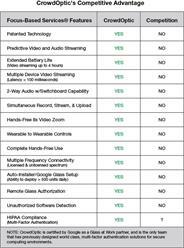 New software features to optimize Google Glass for enterprise video streaming have enabled the company to achieve record sales and 300% revenue growth forecasted for the current quarter compared with the previous quarter. The company has also obtained new patents for key areas of its technology. CrowdOptic is powerful enterprise software for live broadcasting through smart devices. Across industries from healthcare to sports, CrowdOptic is leveraging smart device technology to empower people in the workplace. Our technology is energizing sports broadcasts, improving healthcare, even reducing field support costs in the enterprise. The first smart software for wearable broadcasting that comes with built-in device intelligence, CrowdOptic offers patented Focus-Based Services® based on device engagement. With CrowdOptic, devices simply aim at each other to inherit alternate points of view. A Google Glass Certified Partner, CrowdOptic is a leader in the revolution for wearables at work. CrowdOptic is a privately held company based in San Francisco, CA. Visit www.crowdoptic.com for more information.